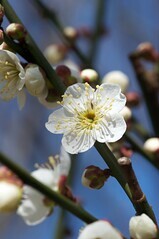 More plum blossoms, this time from the Setagaya ume matsuri (Setagaya ume festival) in Hanegi Park. Once again we got there via the Odakyu Line (I guess that's the line for plum festivals) arriving at the aptly-named umegaoka (plum hill) station. Anyway, with the nice blue sky, it was possible to do a bit more with the pictures this time (grey cloudy skies make for flat pictures), and there's a much wider range of flower types in these pictures. Feeling motivated to try and grow another plum tree after those two series. Maybe third time will be the charm. I also like the blossoms on my asian pear and my peach trees. The rabbits killed the first two (or whatever it was that gnawed the bark off them all the way around- they also got my blueberries, grrr- seriously thought of planting a wire noose where the rabbits got into my yard after the destruction of all four). Yes I used those plastic guards - they were gnawed underneath. My cherry tree survived though; it grows about a foot a year, and barely survives august. Last year it had its first flowers. They lasted quite awhile- at least 10 days. Perhaps it is because it is a fruiting variety.